It allowed you to use Pipes created by other users or create your own. The two-staged shutdown of Pipes begins August 30, 2015 when the service won't support the creation of new Pipes anymore. Existing pipes will remain available in read-only mode until September 30, 2015 when the service is shut down for good. The only part that needs to be modified is the ID which is clearly visible on the Pipes website. ClickScript - A visual programming language that looks similar to Pipes It is open source and can be tested directly on the site without creation of an account. Quadrigram - A business tool to create and publish data driven websites. Superpipes - An open source tool build with Superfeedr. The second popular product that Yahoo decided to shut down is Yahoo Maps. The company announced that it will shut down Yahoo Maps at the end of June 2015. 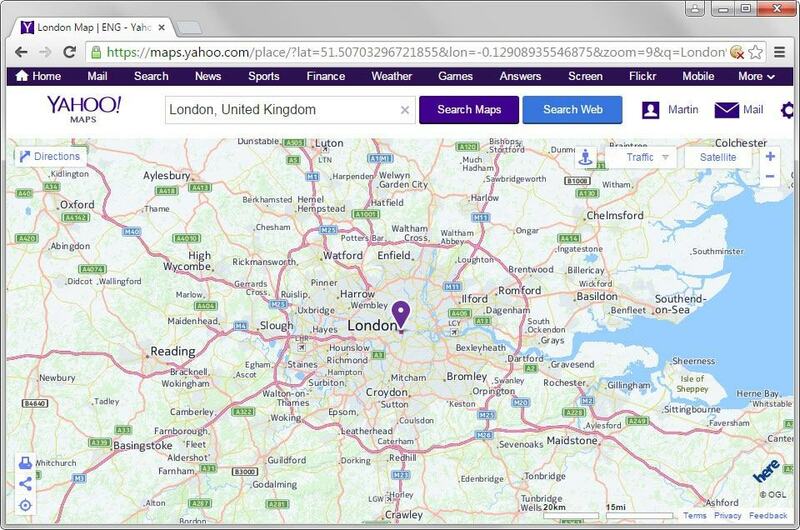 While the main maps interface is shut down, access remains on several Yahoo products such as search or Flickr which have integrated the mapping service. Yahoo Mail support on older iOS devices. Yahoo won't support the built-in mail application on pre-iOS 5 devices starting June 15, 2015. The company recommends to use a browser instead to load mail.yahoo.com in it. Yahoo Contacts syncing on older Macs: Yahoo Contacts syncing won't be supported anymore on Mac OS X 10.7 or earlier starting June 15, 2015. The company recommends to use the web interface instead. Now You: Are you affected by the shut down? Yahoo Inc announced the shut down of several company products that include Yahoo Pipes and Yahoo Maps recently. I’m honestly too young to have benefited from any Yahoo products infact I’m not even really sure if I have an account. So no. I’m pretty sure the only Yahoo product I’ve used is Tumblr. That’s about it. with Tom Hawack’s comment (above). Are you affected by the shut down? I only use their email service, so I’m not affected directly by this. But as I always say, less alternatives means less freedom of choice for users. Yahoo had a good run, but the fact they are getting passed over by a huge chunk of the market in terms of innovations is their downfall. I don’t think they can see 10 inches from their faces and have been making mistakes since Google hit the scene (which they were offered twice and turned it down). It’ll be a loss to some, but there are better more powerful alternatives out there. Yes, I use Pipes to control dozens of RSS feeds I read, either to get at the full articles I want or to remove junk and advertising. I knew this day would come with Pipes, I just wish there was an alternative in place. This is a terrible news for me. I have something like 200+ pipes, and now only have 3 months to find a solution. I will look into alternatives you’ve suggested, I hope it helps me. Yup, I filter most of my over 100 feeds with pipes. I remember when they closed the yahoo briefcase. more than a decade ago, I was basically the only one using it in my class, specially in IT, to save the stuff we made on class. I don’t use pipes, but I know people who use it. the same as it was with google reader. fortunately there are alternatives. companies prefer to shut down useful services used by less people, and keep superfluous services used by many people. the 1st alternative you suggested. Anybody else sees this warning? Part of me always thought that when Google Reader shut down, Yahoo had a great opportunity to pickup those disgruntled used, and should have looked to buy Feedly and integrate it with Pipes, which is how I use it. I wish Flickr would go this route, since I’ve apparently been paying for a premium account for a few extra years longer than they’ve had a reason to even have such a thing. Flickr is just good enough to work but is quickly being outclassed by other offerings, potentially Google Photos for some people. Personally, I have yet to find a decent archive/sharing space for photographs that doesn’t involve Google Drive, OneDrive, or Dropbox. How about imgur.com? Does imgur API lack functionality compared to that of flickr? Martin, you didn’t mention whether YOU are personally affected by any of these terminations. I’m not affected, directly, by any of these terminations but I do wonder how many of the sites I regularly visit will be crippled by the closure of pipes. Wow, such a short notice for “Maps” closure, eh? Cutting the limb out from under lotta “mash-up -ers”. Do the closures of these services represent the end of an era? No, I’m not affected. I did use Pipes in the past and liked it a lot but the service somehow got less reliable and that is when I stopped using it. I really like the idea though. Re: The closure of Yahoo! Philippines homepage, the current status of the local award “Yahoo! Celebrity (formerly OMG!) Awards” (which there was a under-the-radar controversy happened some year back with alleged vote inflation of certain nominees) is uncertain. Local media currently underreport the closure of Yahoo! Philippines. Since the Marissa Meyer era, the Tumblr acquisition happened (which caused divisions within its fanbase), lots of acqui-hires (some of them broke start-up fans’ hearts) happened, and now these. What a reverse of diversification due to low traffic. I’m just sorry to see the long, slow, steady decline of Yahoo. Once upon a time, it was *the* service. Now it’s just a big old nuisance. The Maps service is a little redundant since it is has been powered by MS Bing. They never capitalized on the continual dumbing down of Google Maps ‘My Maps’, but that’s probably due to common mindset of their designers – Only Social Matters. Groups almost disappeared until they realized it could get the ‘Social’ treatment. Unfortunately the great Yahoo profile system was the casualty. Since Groups are so easily created with no moderation, the domain is cluttered with similar sounding and stale groups. Even ‘official’ ones are harder to find in the new Help structure. Arrgghh. I’m very disappointed to learn this. I’ve been using their maps for as long as I can remember – NEVER had a problem. I viewed driving directions to another town using both google and yahoo. Google had me taking a number of side roads and their directions were confusing (are the un-numbered directions supposed to be previews? very confusing). It is nearly an hour’s drive for an appointment so I cannot afford to be wandering all over the countryside. Yahoo was straight forward, although they didn’t get the exact location of my home but that’s not a problem. There were 3 roads I have to use and it does not require that I take a number of side roads (and then doubling back according to google). I will miss this service. I honestly never heard of any of them in particular Pipes. hahaah. Maps thou, is a big shocker. Considrering I didn’t even know they had a Mapping Service. TV and Movies esp will be sorry to go.